'Moving Too Quickly' Again Cited As Cause Of An NPR Newsroom Error : NPR Public Editor A mistake might have been caught with more editorial scrutiny. Michael Cohen walks out of federal court, Thursday, Nov. 29, 2018, in New York. 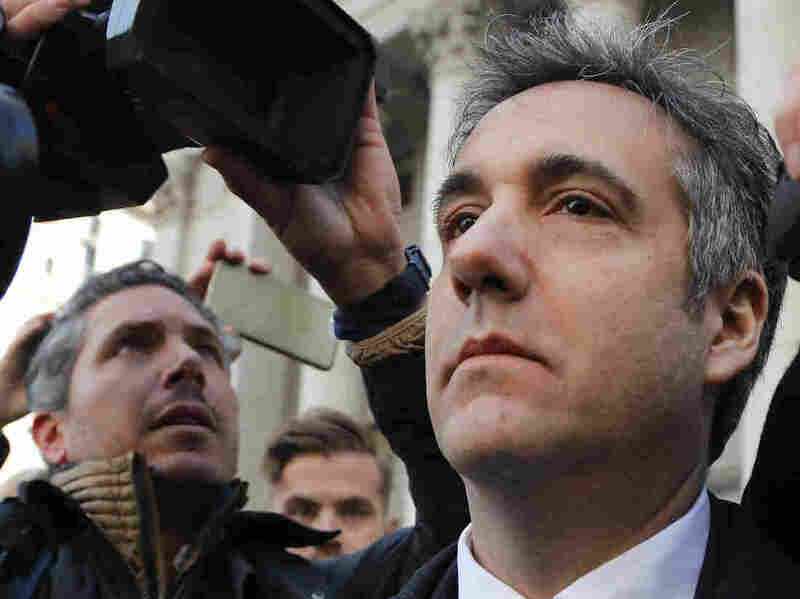 Cohen, President Donald Trump's former lawyer, pleaded guilty to lying to Congress about work he did on an aborted project to build a Trump Tower in Russia. He told the judge he lied about the timing of the negotiations and other details to be consistent with Trump's "political message." "Moving too quickly" has caused NPR errors in the past. It happened again last Friday, only this time the consequences were greater than simply looking silly by mistaking the details of Easter. The Friday online-only morning report, which was updated with an editor's note late that afternoon, incorrectly stated that Donald Trump Jr.'s 2017 Senate testimony conflicted with events described by the president's former lawyer Michael Cohen in a guilty plea on Thursday. The report in question was meant to broaden "the aperture of what people in this affair have told Congress," Philip Ewing, the author of the piece, told me. When he reviewed Trump Jr.'s testimony, however, he missed that in his Senate testimony Trump Jr. discussed two different real estate negotiations. Any preventable error is troublesome for a newsroom, but reporters are human and they make mistakes. NPR corrected this one forthrightly, which is what I would expect. But we live in a time of intense partisan mistrust of national media outlets. Errors involving the president and those around him only fuel that narrative. As Ewing told me: "This episode has painfully reinforced the truth of journalism that if any aspect of a story is questionable or in error, that — for many in the audience — obviates everything else in the rest of a report." Readers questioned how the error came about, why it was not corrected for several hours after the error first surfaced, and why NPR did not simply retract the whole piece. I'll add one more element to examine in these areas: what corrective steps are needed to minimize the chances this happens again, and what best practices are needed if it does? Normal procedure is for any piece to be thoroughly vetted by editors. One of the problems in this case? Ewing is the editor who oversees national security coverage. He also writes regularly. And his boss, NPR's Senior Washington Editor Beth Donovan, told me that "he has an impeccable track record." Donovan said the piece fell victim to "a perfect storm" on Friday. The editors, other than Ewing, who were most familiar with the story were unavailable, for varied reasons, to give the piece the thorough scrutiny needed for any story, especially one dealing with such high-profile matters. The piece was edited, but not by someone closely familiar with the couple of hundred pages of Trump Jr.'s Senate testimony. Ewing is trusted by the newsroom to get things right. Even so, Donovan said, "he deserved a stronger safety net than we gave him." Ewing said the fault lies with him. "I didn't take the time to fully understand the material in the transcript. What appeared to me to be an obvious contrast with Cohen's account was not as clear cut as the passage in the exchange appeared, and it did not take into account other questions and answers in the transcript." He did seek comment from the people involved but did not hear back, so instead quoted Trump Jr.'s lawyer responding in past instances when the congressional testimony was questioned. He also quoted President Trump's lawyer, Rudy Giuliani, and the president himself from a post on Twitter. But journalism is a team effort and editing is also part of the process, as Donovan said. "What I wish I'd done in retrospect," Ewing said, "would be to have one of our digital editor specialists check me more aggressively, but one was not here at the time." A fresh set of eyes would have slowed the process down, but also perhaps prevented the error from appearing online. In the future, he said, "We're going to apply more brakes in situations like this one and involve more editors well before a story is published. And our goal will be to rely less, especially in these high-stakes situations, on the judgments being made by a single editor or correspondent." That's indeed a solution. Alternatively, as Donovan told me, NPR should perhaps routinely assign breaking news to a reporter, so Ewing could edit — his primary job — instead. Another misstep by NPR was leaving the incorrect story posted for too long without some indication that there was a problem with it. NPR was alerted to the mistake when Philip Bump, a Washington Post national reporter, tweeted that the story appeared to be in error. (Andrew Prokop of Vox also tweeted about it at the same time.) That set off a flurry of press reports about the apparent error. Ewing said he immediately began to check. But it takes time to sort out errors like these. Did the whole story need to be retracted in light of the error? And what would an editor's note say? "As soon as we understood there was a problem we were aggressively trying to understand what we got wrong, and how we got it wrong," Donovan said. That process was thorough, but as a result the incorrect story remained on NPR's website for several hours. "Could we have acted quicker? Maybe. But the story is very complicated," Ewing told me. Donovan was more declarative: The lag time was "too long," she told me. There's a middle approach, however. NPR's policy is to correct stories, not remove them, for the sake of transparency. That's mostly the right approach. But in the future, Donovan said, NPR should find a way, perhaps by putting a banner at the top, to flag that a story is being re-examined. That way the incorrect version doesn't sit out there for several hours. I'd suggest a different tactic. Because NPR does not remove material, only corrects it, there's a separate technical issue: The URL (Web address) for the piece, which contains a synopsis, perpetuates the error even now. NPR would have to take down the piece and repost it with a new URL to fix that. So, if NPR had removed the piece initially, the new version could have been posted with a fixed URL, as well. [Update 1: I'm told the publishing system does allow for the URL to be changed without unpublishing and republishing. That step is taken only rarely because it affects how the story's reach is tracked. But in cases like this NPR should immediately change the URL. Some readers suggested NPR should have retracted the whole piece. I disagree. The broader framing was accurate (and others have written similar takes): Cohen's plea has provoked new attention to the Congressional testimony given by Trump Jr. and others. Sen. Richard Burr, R-N.C., chairman of the Senate intelligence committee, told NPR just that, for the Friday piece. Ewing told me he wishes, in retrospect, that he had taken that broader approach to begin with, instead of focusing on Trump Jr.'s specific testimony. NPR is generally, and quite rightly, cautious when it comes to breaking news. If it doesn't have firsthand reporting, it holds off on reporting developments until it does, or at least is very clear to source it to other news outlets. That was apparent Thursday, when other news outlets had reporters in the courtroom while Cohen pled guilty and NPR reporters weren't there. The guidance to the newsroom was to hold off on repeating the reporting of others until NPR got its own confirmation. NPR can be proud of that. So it's frustrating that in this case NPR moved too fast. As Ewing told me, "It is not exemplary of the way we work." I'd agree. There was no harm in waiting until a knowledgeable editor could review the copy, ask the necessary questions, and make sure the piece was correct. To its credit, once the damage was done, NPR in this case moved very quickly on an internal assessment of what went wrong. Here's hoping that this time the lessons learned will stick.